Surfing. Learn it. Love it. LIVE it! Who ARE we? 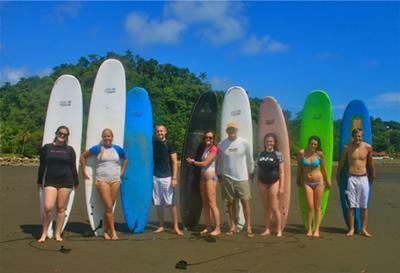 MASS is the FIRST, the SAFEST, and the ONLY true surf school in Manuel Antonio. 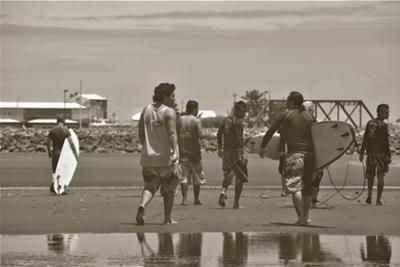 We are fully insured and certified by ISA (International Surfing Association) of Costa Rica. MASS instructors are highly trained in water safety and First Aid. Don't go out into the water with simply anyone renting you a board. Do it right, do it safely, and have the best possible learning AND surfing experience! From beginner to the more experienced surfer, we will outfit you with the right gear and equipment for your sessions with us. Simply looking to rent a board? Coming with a large group? Are you a family wanting an intro to surfing with our family...talk to us about your wishes and needs. We promise you a positive, unique, safe and fun experience with MASS. We know the very best spots for every weather condition and student level. MASS' specialty are Groups and Families! 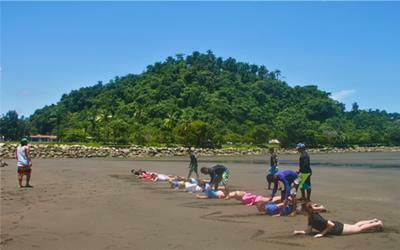 Please contact us for special rates if you are traveling as a Group or bringing your family for surf and fun! Join in and write your own page! It's easy to do. How? Simply click here to return to Local Business Listings.